Kenyans are away from loyal consumers. Retailers and manufacturers are finally getting the hint which is why steep discounts on products has become the norm lately. December 2014 saw Jumia roll out the first ever online discounted sale in Kenya with over 8,000 items on crazy discount. The discount offered special deals and discounts of up to 90 per cent of fashion wear, electronics and home appliances which reflected the traditional Black Friday in the USA the day before Thanksgiving Day. The response was overwhelming as expected. Home appliances topped the deal in the sale that was dominated by Nairobi shoppers followed by Mombasa and Nakuru. Towns across the country also participated in the big sale M-Pesa making it easy for payment. Jumia is now back this time round with a big sale on mobile devices from a range of manufacturers. 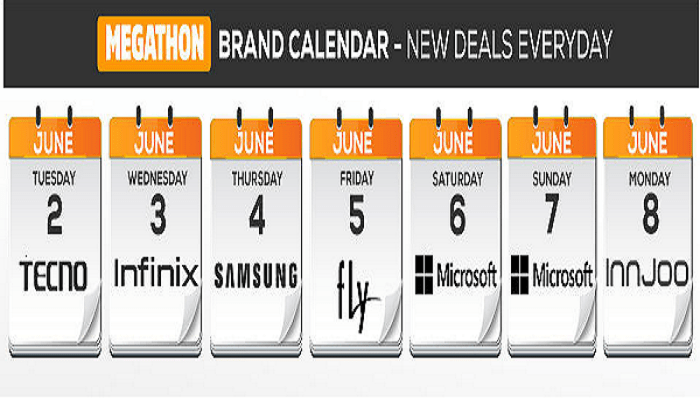 Jumia‘s Mobile Week Megathon sale will run between the 2nd and 8th of June. Unlike the Black Friday Sale which lasted for a day, the Mobile Week will span a whole week and will feature some of the world’s most renowned mobile brands including Innjoo, Infinix, Samsung, Fly Mobile, Microsoft and Tecno with deals which will sell at ‘jaw-dropping prices’. Customers who download the Jumia application for Android, IOS, Windows or Black Berry will receive exclusive early access to the deals from 5:00AM in the morning before the deals go live at 9:00AM on desktop. To ensure that customers don’t miss out on their favourite brands, Jumia will offer a different brand every day. Among the most anticipated deals include Infinix Hot Note to have an incredible discount down ksh 20,998 to ksh10,499, Tecno Y4 at Ksh 4999 down from 6,899 Samsung J1 at Ksh. 9,999 down from 10,999 and Fly Mobile Thunder 3 at 4,999 exclusively to Jumia among others. Recently, Nakumatt held a discounted sale on its items dubbed “Nakumatt Mega Sale” that saw thousands of people turn up for the same. Kenyan retailers are slowly emulating developed economies in a bid to make profits in the same breathe gain customer loyalty from the price conscious consumer.